Hello Stampers! This is week 3 of the Bling Girl's Halloween projects. Today I have a card to share with you. I love the banners on Authentique's Thriller sticker sheet. There are so many fun elements from this one sticker sheet to use. I cut out the hexagons from the Thriller patterned paper to incorporate into the banner on this Halloween card. The sentiments are from the sticker sheet. I hot glued the shapes to the jute to make sure it holds. 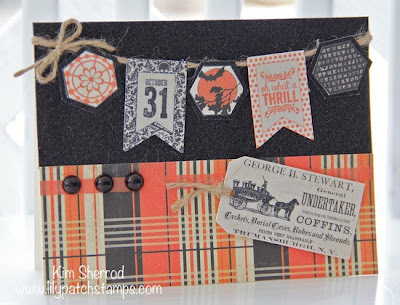 I then combined the black glittered paper with the plaid and adhered all the elements onto it.